Have you ever wondered what you grading certificate actually says? Well I have been asked a couple of times with regard to both Kyu and Dan grade certificates, so I thought I would write a post on it. I will deal in particular with JKS certificates but many martial arts follow a similar format. So starting at the top of the certificate and working down. 証 = sho meaning proof. This is the first of three kanji that make up the word shomeisho meaning certificate. There is then a space for the students name to be entered followed by 殿 = dono, this is a polite form of name suffix that might be used in a formal letter, similar to Mr. but is not gender specific. Next comes three kanji with spaces after them, this is where the day, month, year is entered.日= nichi meaning day, 月 = gatsu meaning month and 年 = nen meaning year. The date is followed by our association name and its hanko (red seal stamp). The full name for the JKS is Japan Karate Shotorenmei, renmei translates to league, but on the kyu grade certificate is a slightly different ending. 曰本 = Nihon (Japan), 空手 = karate, 松涛 = shoto, 会= kai which means association, this is a shortened version of kyokai, but they both represent the same meaning. Lastly is the space for the name of the grading examiner. 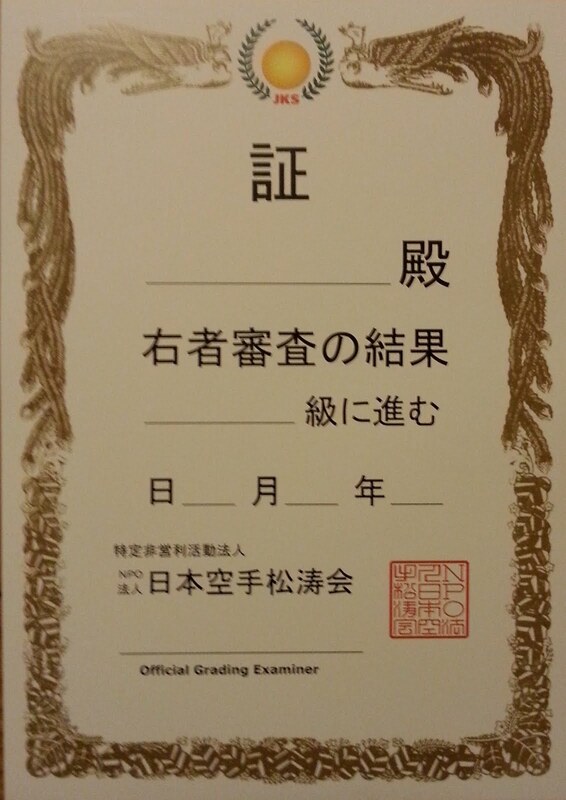 In the JKS this certificate is used for Shodan to Yondan. It has both Japanese and English and is an international certificate intended for use by non-Japanese. When writing formally the Japanese write in columns, reading from right to left, so lets start in the top right hand corner where there is a partial red stamp above a vertical line of kanji. The stamp is an authentication stamp, half the stamp is on the certificate and the remaining part of the stamp is in the JKS records. If you put the certificate next to the record they make a complete stamp and this verifies that the certificate is authentic. Next the kanji, if you look closely the top and bottom kanji are printed and the others are hand brushed. 第 = dai and 号= go, dia is the ordinal number prefix and go is the suffix, together they mean number and usually surround a serial number, as is the case here. You may recognise the word dia from Asai Sensei's basic series of kata dai ichi to dai yon, the third kata, dia san became better known as jo no kata, anyway back to certificates. Between dia and go are the kanji for a series of numbers 一 = 1, 二 = 2, 三 = 3,四 = 4, 五 = 5, 六 = 6, 七 = 7, 八 = 8, 九 = 9 and zero is written as usual (you can also pronounce "zero" in Japanese as it is borrowed) so on Rebecca's certificate it reads 第一0四五二号 = serial number 10342, this will correspond to the registration number written in English towards the bottom of the certificate. 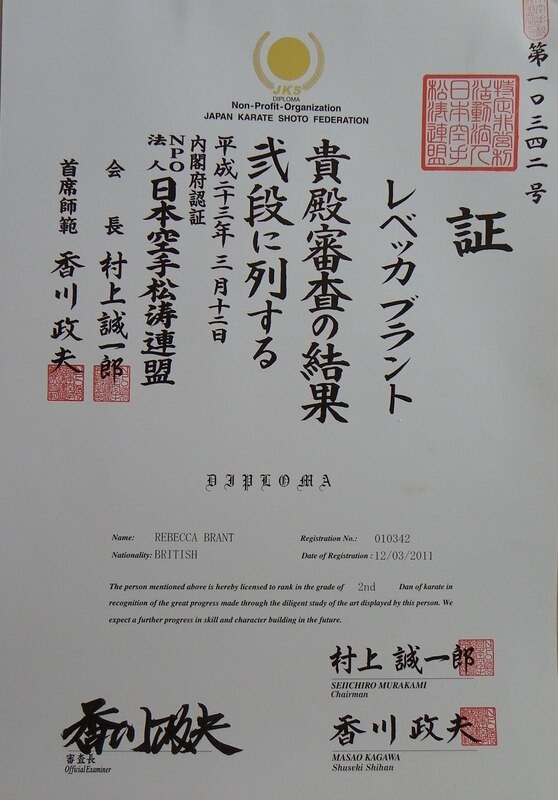 Just to the left of the registration number is a large red hanko stamp of the JKS and below the hanko is the large kanji 証 = sho meaning proof, as explained in the kyu certificate above. The next column to the left appears your full name, your christian followed by your surname, again this will have been hand brushed. Next comes two columns of kanji, seven, then six, the top kanji on the second column will be hand brushed, the rest will be printed. This is similar to the long phrase on the kyu certificate. 貴殿 = kiden meaning you, the first kanji is 貴 = ki meaning precious, the second kanji is 殿 = dono, as in the kyu certificate explained above. The next bit is also as the kyu certificate 審査 = shin-sa which means examination, this is followed by の = No, which is a particle that indicates possession. After this is 結果 = kekka which means result. The first kanji on the second column is a number indicating your dan grade, however they are not all the same as the list of numbers used for the serial number. These are formal numbers, they are also used on the Japanese currency. 壱 = 1, 弐 = 2, 参 = 3 this set of kanji is called daiji (大字) and used in legal and financial documents to prevent unscrupulous individuals from adding a stroke or two, turning a one into a two or a three. The formal number for 1 is not even used because we use 初 = sho as the first dan rank. The number is followed by 段 = dan, the next is に = ni which is another particle that indicates a person or thing is "in, at, on" 列 = retsu meaning line or column, this might ring a bell as it is said to call us to line up before a rei and then すら = sura meaning even. So on Rebecca's certificate reading the two columns as a whole it reads "superiors examination results : line up with the nidan ranks". Right now for the next column, this is the date, printed on the certificate is the following : 平成___年___月___日and the blanks will have been hand brushed in. You will notice that the set up is different from the kyu certificate. Again this is a formal document so the imperial calendar is used. 平成 = Hei-sei, the current emperor of Japan. He began his reign in 1989 and this is the year we start counting from, next goes the month and then the day. Oh 十 = 10 by the way, so reading Rebecca's certificate, 平成 二十三年三月十二日= Hei-sei 23 year 3 month 12 day. So dealing with the year first, 1989 + 23 - 1, (it is -1 because you count 1989 as well) = 2011 March 12th, the kanji for year, month and day are as the kyu certificate, listed above. Next comes the name of our association, the JKS and unlike the kyu certificate it is written with the renmei ending: 曰本 = Nihon (Japan), 空手 = karate, 松涛 = shoto, 連盟 = renmei. 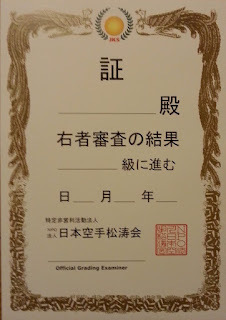 On Rebecca's certificate there are two more vertical columns of kanji, but on my sandan certificate these are not present, so they may or may not be represented on yours. So the first column is for the Chairman of the JKS - Seiichiro Murakami, his appointment comes first, 会= kai meaning association and 長= cho meaning head, then his name, the kanji for his surname first and then his christian name. The next column is for the Chief Instructor of the JKS, Masao Kagawa, again his appointment first, 首席 = Shuseki meaning chief, but reserved for a head of a large organisation, 師範 = Shihan, then his name, in the same format. The personal seals are stamped over the name, and these officials will match those at the bottom right of the certificate. 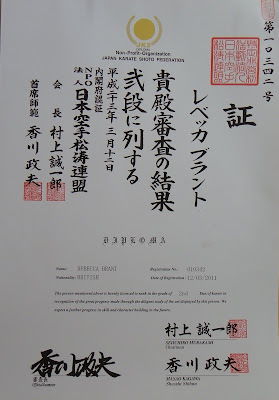 At the bottom left hand side is the space for the Official Examiner, on Rebecca's certificate it is Kagawa Sensei, but the name is hand brushed and not printed as are all of the other positions. Anyway hopefully that has answered any queries you may have had regarding your certificates. A traditional Shotokan Karate Club training at Barlby High School, Barlby, near Selby, North Yorkshire, England YO8 5JP, Mondays and Wednesdays from 6.30pm. Click on the yellow buttons below to return to the begining of the blog or review the pages under the various sections. If you cant find what your looking for click the "Contact us" button to E Mail the Club Secretary.